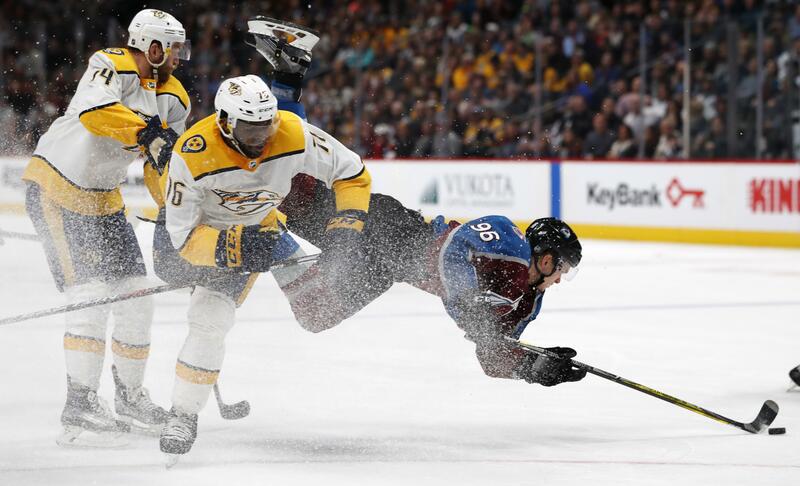 Fri., March 16, 2018, 11:20 p.m.
DENVER – Colton Sissons and Filip Forsberg each scored twice, backup goaltender Juuse Saros stopped 33 shots and the Nashville Predators became the first NHL team to clinch a playoff spot this season by beating the Colorado Avalanche 4-2 on Friday night. Starting goalie Pekka Rinne was given the night off after helping Nashville to a win at Arizona on Thursday. The team didn’t miss a beat with Saros in net. CALGARY, Alberta – Evander Kane scored four goals to lead San Jose Sharks past Calgary. It was the first NHL hat trick for Kane, acquired from Buffalo just before the Feb. 26 trade deadline. ANAHEIM, Calif. – Corey Perry scored a tiebreaking goal late in the second period, John Gibson made 28 saves and Anaheim defeated skidding Detroit. Nick Ritchie, Derek Grant and Ryan Kesler each had a goal for the Ducks, tied with Los Angeles for third place in the Pacific Division. Anaheim has 84 points – also the same amount as Colorado and Dallas, which hold the two wild-card spots in the Western Conference. WASHINGTON – T.J. Oshie, Nicklas Backstrom and Matt Niskanen scored as the Washington Capitals swept a home-and-home set against skidding New York. Alex Chiasson had a goal and two assists for the Capitals, who hammered the Islanders 7-3 in New York on Thursday. Jakub Vrana’s goal gave Washington a 5-1 lead with 9:04 remaining. Lars Eller added an empty-netter, and Braden Holtby made 22 saves. Mathew Barzal, Brock Nelson and John Tavares scored for the Islanders, who have lost 10 of 11. OTTAWA, Ontario – Mike Hoffman scored at 3:26 of overtime and Ottawa beat Dallas to win their third game in a row for just the second time this season. Ottawa won on home ice for the first time since Feb. 17. Marian Gaborik and Matt Duchene also scored for the Senators (26-33-11), and Craig Anderson made 23 saves. Tyler Seguin and Tyler Pitlick had the goals for the Stars (38-26-8). Ben Bishop, who stopped 22 shots, made his first start since missing five games with a knee injury sustained March 5 against the Senators. Bishop has a 9-0-4 career record against Ottawa. LAS VEGAS – Jason Zucker, the only NHL player raised in Nevada, scored a goal and assisted on another to lead Minnesota over the Vegas. The Wild, who had lost two in a row and four of seven, completed a 3-0 season sweep of the Pacific Division leaders in front of 18,295 fans. Charlie Coyle, Matt Dumba and Zach Parise also scored for the Wild, and Alex Stalock stopped 26 shots. Erik Haula and Ryan Carpenter scored for the Golden Knights, who dropped to 24-9-2 at home and have lost four straight in T Mobile Arena. Published: March 16, 2018, 11:20 p.m.